For the last too long to recall years I’ve thought of Thanksgiving as a holiday of tradition. When I was a kid we did the same thing every year on turkey day. We did a family thing. Whether it was a large gathering or small it was always with family. My family changed over the years a lot. My parents divorced and there were step-parents and step family. There were some years I didn’t even see my mom. That’s for another post . And some years I had boyfriends and chose to spend my holiday with them. Some years were fun and comforting other years the celebrations somber or even angry. But the permeating theme for me was family and friends gathering. And also food food food. When my dad was married to his second wife we ate chicken as he hated turkey. But we still got out the good China and sat down and thanked God and got down to some good eating. When I was in college the holidays became a game of driving from one parents gathering to another with a hopeful stop at some friends in between. But I actually liked this musical chairs and of course the multiple meals. After I was married a few years we took over the hosting of Thanksgiving from my in laws. My husbands family is large. With six sons and their families often we had 25 or more at our home. We shared food duty. Everyone bringing something but it was a huge amount of work but for me it was pure joy. I had always wanted to be part of a large family. So as luck would have it I married into this big family and as I said I took over hosting the family. And I loved it. About five years ago things changed as my in laws began their decline. My father in law had dementia and my mother in law suffered a fall she never really recovered from and neither of them could travel to my home to celebrate. So things changed. Some years we brought the feast to them. Their house filled with family and food was eaten with my mother in law acquiescing control to others in her home and my father in law tidying up as we finished as his need to keep order was calming to him as his Dementia worsened and he eventually didn’t know who he was tidying up after. And as those years progressed we began to take turns and go over separately. Each family visiting them alone for a bit but trying to overlap so we could see some of the others in the family. Sometimes a big bunch of us would still end up there and my in laws seemed to fare ok. I have so many pictures of us sitting on their sofa with them. I miss that. Kevin’s big family was growing more with grandkids marrying and great grandkids being born. And those expanding families began new traditions of having their holidays with their new brood. It’s just what happens. But I miss them. Today I’ll miss all that chaos. We lost Kevin’s parents recently and my dad as well though I didn’t see him on Thanksgiving typically but we always spoke. My mom now lives with us. With all the changes – especially with the loss of my mother in law – we are all figuring out what the holidays will look like now. My family – my three teen kids- my mom – and Kevin and I – talked about what would be a fun new tradition for us. We decided we wanted to do the holidays at our new beach house. We invited the extended family as our doors are always open but this year they are all trying on their new traditions as the beacons that brought us together are now gone. Though I’m sad for all the losses -I’m really excited for this new way of celebrating. Since my last surgery I’ve been feeling better. I still have some pain that will hopefully improve but I’m able to cook again. I’m not cooking the meal! No. Bethany Blues – a great restaurant nearby- made the dinner. We began to order our holiday meals not long after I got cancer. Making the entire meal is too overwhelming – so I made desserts with my mom. We have one more pie to bake today. Then all I have to do is heat the meal up later. I actually like to cook and I’m thankful that I’m now able to do so but I just can’t physically make such a big feast -and frankly I like the ability to relax with family on the holiday. My kitchen duties are much less this way. I will miss the big family gathering and we are now trying to make sure we all find some way at least once a year to try to get Kevin’s brothers and families together at some point. I suspect it’s going to be hard especially as the families expand but it’s important to try I think. I have one brother and it’s infinitely hard for us to get together. Getting six families together will be challenging. I’ll miss seeing my mother in law. If she was still here we’d be going to see her today at her assisted living facility. But I know she was in pain and unhappy living there. She tried to make the best of it but I’m glad the Lord called her home to be at peace. But she won’t be out of my head today. So here I am writing this at the beach house. Kevin and my daughter have left and are off to run in a Turkey Trot together. I don’t trot except for on a horse -and I think this is a nice father daughter tradition. I think I’ll honor my dad today by spreading more of his ashes in my garden. I feel he’s a part of this house – a place he never has been but a place I would have never had if it weren’t for him. I’ve found things can change so fast and we have to learn to ride the waves. I have had many changes in my life and seem to have managed to morph as needed. It’s not always easy. Many times I’ve dragged myself into the next iteration of life kicking and screaming. But this new way of being together over the holidays is exciting to me. Tomorrow we will go to Lowe’s to pick up our new fake tree that we will set up here at the beach house and will decorate this weekend in preparation to have Christmas here. We will have a tree at home in Maryland too Just in case the weather strands us there. It’s all about being flexible. So today I will be thankful for many things. Family and food and improving health. And I’ll be thankful for new traditions. It’s change that makes us grow. As my dad would have said “it will put hair on your chest” (for years I didn’t get that but I do now. My dad’s sayings – Lord I miss those!). Happy Thanksgiving – with love from me. The thought I might never ride a horse again had crossed my mind from time to time this last year. I am pretty sure my own horses don’t really mind that-but it has been hard for me to concede to that fact that my riding days are over. So I’m not really going there yet. But right now I am not supposed to ride a horse. Not only my horse – any horse – no can ride. This has to do with the fact I have had two major nerve surgeries on my arm and chest wall and a fall off a horse would definitely not be good for me. Had I known my riding days were limited I would have ridden more when I had the chance. There really isn’t any sense in those regrets but that is how I feel much of the time. I am a very active person or I was. Since laying in bed with chronic pain for many months I am basically starting all over trying to get myself back into shape. It’s not easy when you have physical limitations and chronic pain. Can’t lift weights with upper body. Can’t bear weight on my right side using arm. Can’t paddle anything. Like a kayak or stand-up paddle board. And you get my drift. So I’ve been trying to figure out what I can physically do because focusing on what I can’t do is just depressing and not productive. And there are many more things I can do than can’t. Ride in the front seat of car again. I can brush animals with my good arm. The fact I want to ride a horse again is a good sign anyway. The fact that I can’t -for now – is just a hinderance. 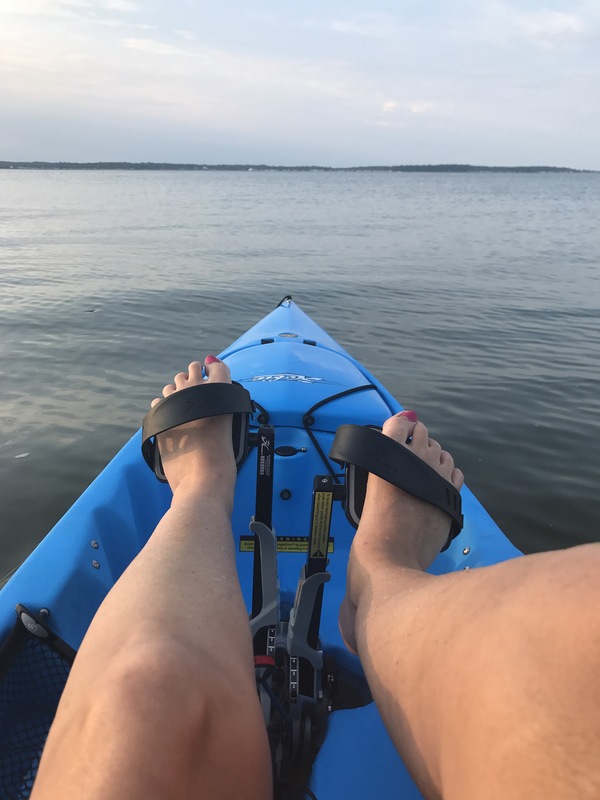 With our traveling back and forth to our beach cottage I’ve been trying to figure out what I could do for activity on the water. Kevin and the kids got stand up paddleboards and they are so cool! I can sit on one while Kevin paddles and that’s fun. 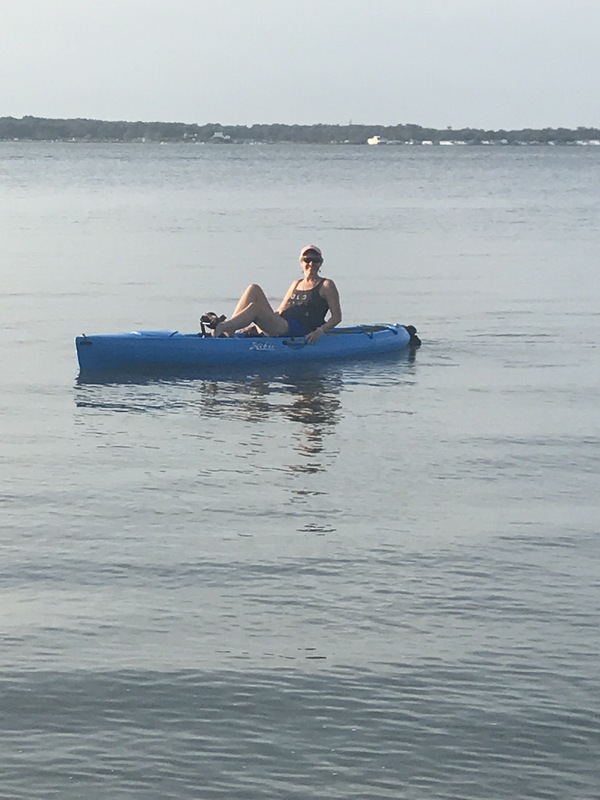 We got a two man inflatable kayak and that’s fun too – but I have been just a passenger bc I can’t paddle it. Passengering is ok. It’s fun sometimes – but I don’t want to be the passenger all the time. I thought there must be a water device that has pedals. So I looked up kayaks with pedals and they exist! I found out fisherman use them as it makes it easier to maneuver while fishing. So we found a kayak outfitter in Lewes ,DE about 40 minutes from our cottage. We worked with one of the salesmen and he gave us the lowdown on different types of pedal kayaks. We selected a Hobie kayak. The price was fairly high (I may have gasped) but I really wanted independence. 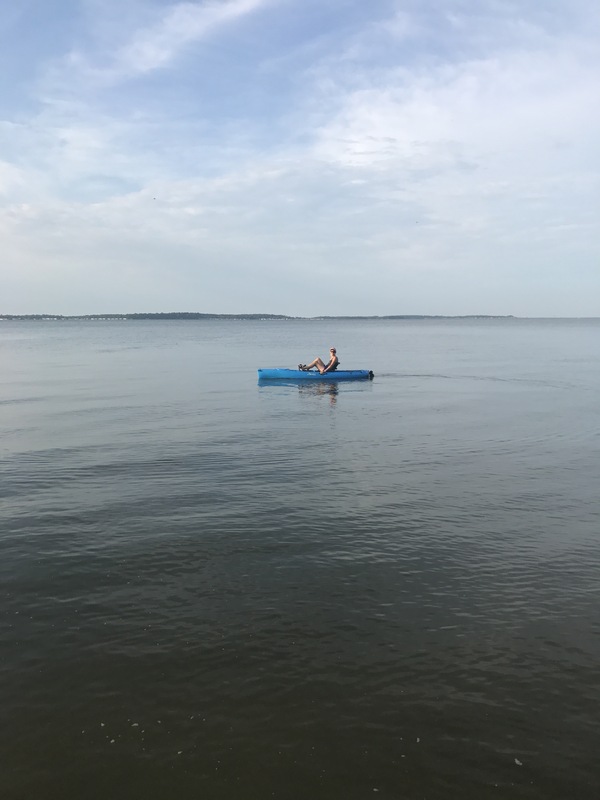 I wanted an “I Can” that I could do with my family on the water and I wanted something that gave me independence like the bike did. The price was worth it. The feeling of being on the water is amazing. I love the serenity and the exercise. I love the freedom and independence. Link to the paddle sport shop Facebook page where they posted our picture. Here’s some info about the Hobie Mirage kayak I got. I remember sitting in a therapy group years ago. It was well before I was going for myself. I always went in the hopes I could find ways to change other people in my life that I thought needed changing. I wasn’t ready to change me. I was fine. In that group I learned about The Inner Child. Back then Author John Bradshaws ideas of finding the inner child and healing the inner child were big in therapy groups. That group was BIG into healing the inner child. We had to get up and speak to our inner child. I hated that. I was there to fix someone else. I was fine. Yes my dad drank. Yes he had anger issues and yes I grew up in a dysfunctional family but my inner child was fun. I was there to fix a guy. A guy I was dating. I still recall the house where we met. It was a funky cottage in an older section of Bethesda, Maryland. Not far from the Potomac river. It was an eclectic neighborhood. And the house vibe wasnt what I would have expected for a therapist but the room with its area to sit in a circle on the floor with pillows lent itself to comfort and a safeness. But when we had to talk to our inner child I thought they were all nuts. I only attended two or three sessions. During the last one I attended a woman a little older than me decided to put it out there for me -she said that I needed to stop and look at myself and ask myself why I wanted to date such people that didn’t want to commit to a full relationship. It wasn’t him it was me that needed to change. I was taken aback and left that night never to return. I wasn’t the one who needed to change. It was him. I was only 24 or 25 years old. I wasn’t there yet. I was so immature. I didn’t see what the others saw. But good for me to seek therapy. Good for my mother who herself went to therapy over the years even when people made fun of those who sought such help. She taught me not to question therapy it was just something one did like go to the dentist. I saw no stigma. I just wasn’t ready to search inside myself. As the years progressed I went to a number of therapists. Some didn’t jibe with me so I left treatment. Othees worked out well for me and I stayed with them for years. My last one -Barbara-who we (my entire family ) saw died of Colon cancer. I still miss her and haven’t found anyone since that was a good fit for me. But i will. But before Barbara there was Claudia. She might even read this as we are Facebook friends. Claudia. She was my therapist right before and a then after I married. She was the perfect therapist for me at the time. She got me to work on me. She wasn’t a Bradshaw enthusiast I don’t think though I’m sure we did work on my inner child in many non-direct ways -like in regression therapy. Claudia and I talked, she did Reiki, tap therapy (as I was dealing with terrible anxiety) , hypnosis and more. She was a kind and caring person. She championed me and I’ll never forget her. She made me see my inner self and my inner child. She helped me realize that I was a good person and I deserved good things. Though I still struggle with that sometimes. But I came to realize we never really grow up all the way. And the most evolved humans are the ones who embrace their inner child and spend time healing any brokenness or trauma that child encountered. And It’s fun to act child like sometimes. The other day my BFF from childhood -Eileen-sent me a text and in that text she wrote something that made me belly laugh. It hurt too since I’m recovering from surgery! But it’s good to let that child shine through sometimes. We go back almost 50 years. That’s a lot of lifetime but we still can snicker like the teens we once were. My husband gets together with high school friends and they go on and act like they are still 17. It’s a good thing I’ve known a couple of them for almost as long as he has or the jabs and old stories and theimmature behavior might get old -but I can join in some bc I have old stories with some of them -though I forget many of them but our friend Terry has us doubled over much of the time. That’s the kids in us. Those connnextions are a blessing. Tom Atkins wrote a poem about picking a honeysuckle and tasting its nectar and how it brought him back to his childhood. I love the poem be when I read it I felt it. I was picking honeysuckle as a girl and then later with my little kids. When I read that prom it warmed me ane I felt that child inside me giggle. So all these years later I’ve come to know my inner child and I’ve worked on her. I’ve know when I go to therapy I go to help me not another person. Little Anne is in there and she has healed a lot over the years because I worked on both of us. We still have a ways to go. I still have a lot to figure out. 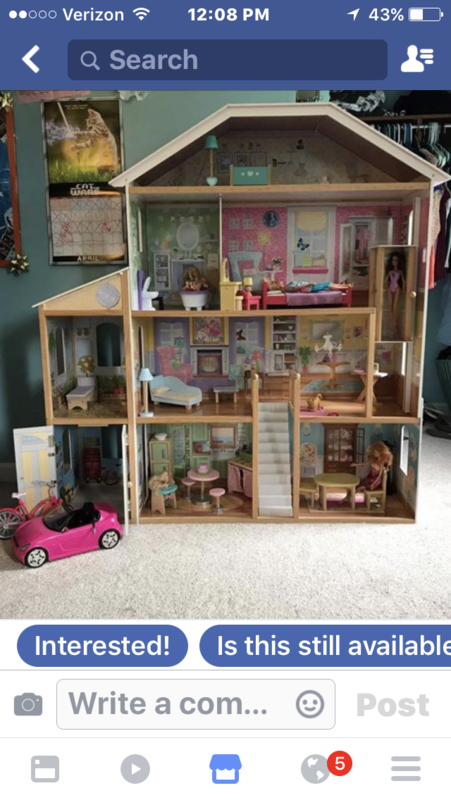 A couple weeks ago I was perusing one of the local online yard sale pages and I saw this Barbie dollhouse. (See below). It came with the furniture and car. My heart jumped. I wanted it. My innner child jumped out and sang “get me that dollhouse”. I had one as a child though these have evolved and are even better than before. But I remember seeing that dollhouse under the Christmas tree one Christmas morning many years ago. I still remember how I felt. I have no room for such a thing and no reason to buy it- except for the way it makes me feel. Like a kid again. And that’s a good thing. I didnt buy it. But I saved the picture. I hope it goes to little girl who will someday when she’s middle aged look at a picture of a dollhouse and feel the way I felt when I saw it. I’ve come to love my inner child. For a long time she was hurt and she was ignored. And that hurt child helped facilitate some bad choices bc she was hurt. But Now we are one. I’m am and adult and I am a child and we love dollhouses. Screenshot Photo cred: Facebook yard sale site.